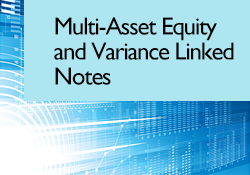 Multi-Asset Equity and Variance Linked Notes | SciComp Inc. In response to the increased popularity of multi-asset equity and variance linked notes, e.g. auto-callables, reverse convertibles, basket variance structures and callable equity and/or interest rate range accruals, SciComp is pleased to announce support for these structures using both PDE (partial differential equation) and Monte Carlo based pricing methods. Pricing models for these and related contracts are available as stand alone Excel spreadsheet and add-ins, Windows/Unix executables that are readily customizable or as part of SciFinance, SciComp's automatic C/C++/CUDA pricing model source code generator. Possible underylings include (but are not limited to) single assets, indices, and average or best/worst performance baskets. For up to three assets under local volatility dynamics a PDE method using SciComp's predictor-corrector ADI solvers is generally faster, while the Monte Carlo method is applicable for larger baskets, complex path dependencies or more complex dynamics. Among features easily describable are simple or moving knock-in and knock-out (auto-call) barriers which may be either discretely or continuously monitored, discrete absolute or proportional dividends, quanto features, and simple, range accrual and/or snowball coupons. In PDE models finite difference grids may be structured to place barriers on grid points (continuously monitored) or at midpoints (discretely monitored), and densely spaced around barriers for rapid convergence and smooth Greeks even with highly discontinuous payoffs. In Monte Carlo models Brownian bridge continuity corrections may be specified for continuous monitoring of barriers while high dimensional quasi-random sequences greatly reduce variance. In either method sensitivities to any underlying model and contract parameters can be easily defined. A wide range of interfaces are available with SciFinance including .NET, COM, Java, Excel, and Python. Need more information on the Multi-Asset Equity and Variance Linked Notes?